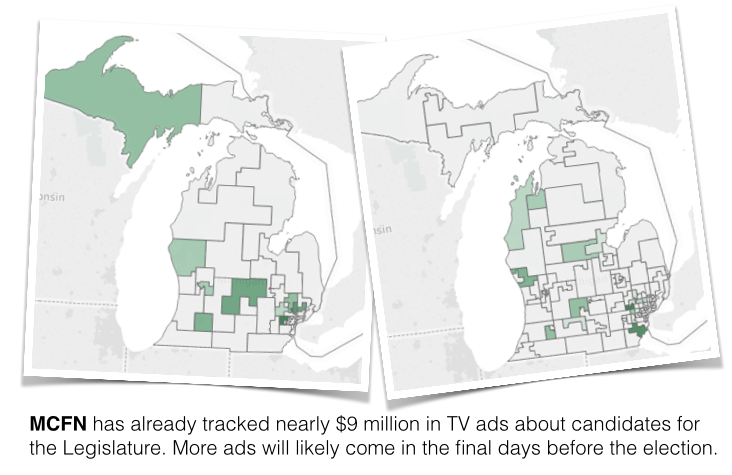 LANSING (Oct. 25, 2018) — Nearly $9 million in ads about candidates for the Michigan Legislature have already aired this fall or will air in the coming days, according to an analysis of ad-tracking data and public records. On Nov. 6, Michigan voters will fill all 148 seats in the Legislature, deciding whether Republicans will maintain control of the House and Senate or whether Democrats will break up the GOP majorities. The battle for votes is playing out across dozens of swing districts. 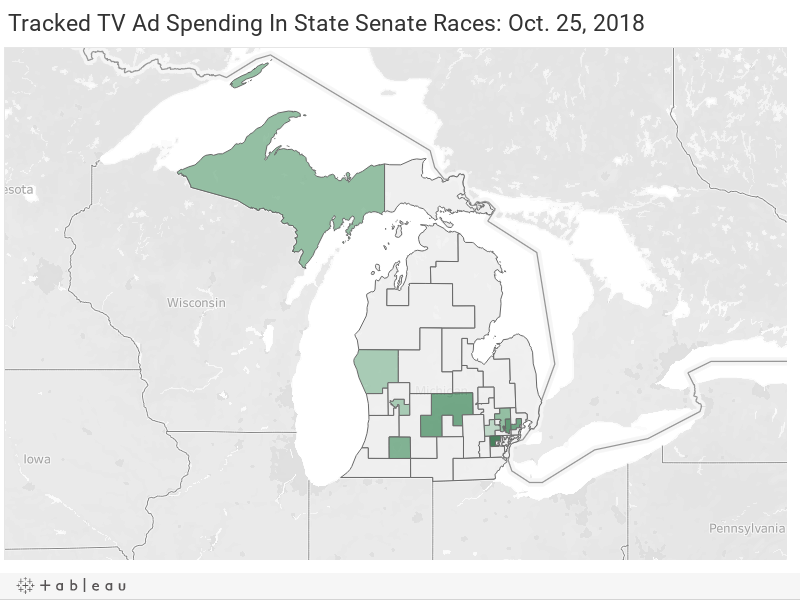 The Michigan Campaign Finance Network has tracked at least some political ads this fall about candidates for the Legislature in 21 of the 110 House districts and 14 of the 38 Senate districts. Of the $8.9 million in ads, MCFN tracked about $3.4 million in ads that either promoted the Democratic candidate or criticized the Republican candidate and about $5.5 million in ads that either promoted the Republican candidate or criticized the Democrat. A majority of the money continues to go districts in Southeast Michigan. MCFN tracked about $4.8 million in ads in districts based in Macomb County, Monroe County, Oakland County or Wayne County. To arrive at the numbers, MCFN analyzed tracking data on broadcast ads that have aired from Kantar Media/CMAG and examined hundreds of public disclosures to Federal Communications Commission on cable and broadcast purchases that have been made by political groups. The numbers for broadcast ads generally cover through Oct. 22 while the numbers for cable ads cover disclosures that were available as of Thursday, Oct. 25. Some of the cable ads included in the tally will air in the coming days. The cable and broadcast disclosures filed with the FCC may not be conclusive because it’s up to TV stations and cable providers to ensure the filings are timely and accurate. And the public filings are not always up to date or 100-percent accurate. In addition, the analysis included only ad purchases that could be tied to specific legislative races. Some of the ad disclosures didn’t include any information about the subject of the ads so the ads couldn't be tied to races. Below are maps showing the Senate and House districts attracting the most TV ads so far, according to the analysis. MCFN will work to update these maps throughout the rest of the year. Scroll your mouse over the districts to see how much spending on ads we've tracked in that district's race. You can use the + or — in the top left corner to zoom in or out. You can use the triangle to change your view of the map. On a phone, use your fingers to zoom in or out and navigate the map. — Of the spending on ads in races for the Senate, Republicans have a major advantage. The analysis tracked about $3.55 million in ads that aimed to benefit the GOP candidate while it tracked only $1.79 million in ads that aimed to benefit the Democratic candidate. — The Livonia-area 7th District is now the district that has seen the most spending on TV ads, according to the analysis. There, Rep. Laura Cox, a Republican from Livonia, is running against Dayna Polehanki, a Democrat from Livonia. About $932,000 in ads have targeted the race so far with a variety of groups getting involved, including the Michigan Chamber of Commerce and a nonprofit called Michigan Citizens for Fiscal Responsibility. — Democratic groups have more closely matched the spending of the Republican counterparts in House races. The analysis tracked about $1.62 million in ads that were meant to benefit the Democratic candidate while it tracked $1.93 million in ads that were meant to benefit the Republican candidate. 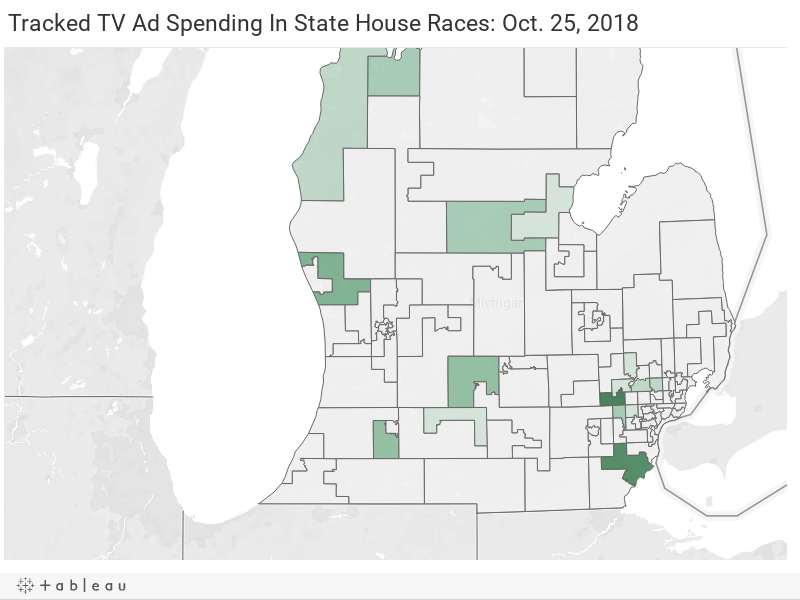 — The Oakland County-based 38th District is the House district that has drawn the most spending on TV ads so far this fall. There, Rep. Kathy Crawford, a Republican from Novi, is running for re-election against Kelly Breen, a Democrat from Novi. The analysis tracked about $595,000 in ads in that race so far. The Michigan Democratic State Central Committee has spent heavily on the race, according to FCC disclosures.